"Durable, portable, and easy to use." "Spacious enough for large breeds to splash around in, letting them cool down in the summertime without damaging the product." "Easy to set up and durable enough to withstand a dog’s rambunctious play." "This heavy-duty dog pool is sure to last you for many summers to come." "This collapsible tub is easy to set up, and its small size is perfect for little dogs." "A lightweight kiddie pool that can accommodate smaller dogs and puppies." This reasonably priced dog pool gets top marks because it’s durable, portable and easy to use. The Frontpet Foldable Dog Pet Pool Bathing Tub comes in three different sizes to accommodate all types of dogs, and reviewers say it’s a must-have for all pet parents. The large dog pool from Frontpet is 12” deep and 50” across, making it big enough to accommodate larger breeds, such as labradors. The exterior is made from PVC, and the bottom is durable to prevent any punctures from your dog’s nails. The pool has segmented sides that fold up for compact storage, and there’s a drain plug that allows you to quickly empty any water. Reviewers say their dogs love cooling down in this doggie pool on hot summer days, and many note that it’s durable and easy to store. However, it’s worth noting that if your pup likes chewing on things, they could damage the sides of the pool, so it’s best to supervise them while they play. Big dogs need big pools, and your best bet is probably the PYRUS Collapsible Pet Bath. The extra large dog pool is spacious enough for large breeds to splash around in, letting them cool down in the summertime without damaging the product. This pet pool is 11.8” deep and 63” across, making it the perfect size for large dogs. It’s made from PVC, so it can stand up to your pooch’s nails, and its segmented sides collapse down for easy storage. Further, there’s a built-in drain plug that allows you to empty the water. If you’re not sold on this dog swimming pool, just take a look at the glowing reviews from happy pet owners. Many say that their dogs love playing in the pool, and several note that their pooches dig in the pool without damaging the bottom. If you’re looking for a durable pool that can accomodate large dogs, the PYRUS Collapsible Pet Bath is a worthwhile investment. To minimize your work on hot summer days, you need a pop-up pool like the Petsfit 41" Foldable and Portable Pet Swimming Pool. Reviewers laud this product as being easy to set up and durable enough to withstand a dog’s rambunctious play. This pool from Petsfit measures 12” deep and 41” across, making it suitable for small to medium-size dogs. Larger dogs could probably fit in it, but they won’t have much room to splash around. The pet swimming pool has segmented sides that pop into place—no air needed—and the inside is lined with heavy-duty plastic to prevent nail punctures. One downside of this product, however, is that it doesn’t have a drain, so you have to tip it over to empty out the water. Overall, reviewers are pretty happy with the Petsfit 41" Foldable and Portable Pet Swimming Pool, writing that it’s a breeze to set up and break down. The pool folds up into a compact size for easy storage, and many note that it comes at a good price! While it’s significantly more expensive than other options, this heavy-duty dog pool is sure to last you for many summers to come. The One Dog One Bone Dog Pool is big enough to accommodate even the largest dogs—one reviewer says her two Newfoundlands both fit in it at once! This top-rated dog pool is shaped like a bone, and it measures 11” deep, 44” wide and 66” long. It can hold up to 85 gallons of water, and it has a drain that makes it easy to empty when your dogs are done playing. The pool is made from the same heavy-duty plastic as truck beds, making it both UV- and chew-resistant. It is truly made to last! 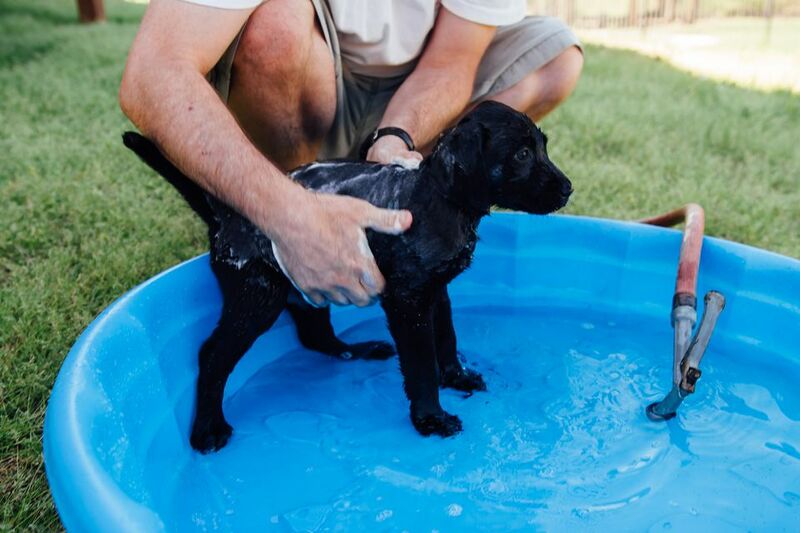 According to users, the One Dog One Bone Dog Pool is well worth the investment, as it’s incredibly durable and perfect for large dogs like labs and German shepherds. Plus, the cute bone design will look great in your backyard during the summer! If you’re the proud owner of a small dog breed, you don’t necessarily need a huge dog pool. For a smaller, more compact pool that will still let your pooch take a dig, consider the KOPEKS Outdoor Swimming Pool Bathing Tub. This collapsible tub is easy to set up, and its small size is perfect for little dogs or poppies. The KOPEKS Tub is just 8” deep and 32” across, and it has segmented sides that allow you to fold it up when it’s not in use. However, it’s made from durable, industrial-strength PVC to withstand even the most vigorous play. There’s an easy twist-off drain cap to empty the pool, and it comes with a plastic carry case that makes it convenient to store. Reviewers say this pool is ideal for small breeds and that it holds up well, even against their dog’s nails. It’s lightweight and easy to set up, and you can’t beat the price at under $30! If you prefer a hard plastic pool for your pup, the STARPLAY™ Large Apple Pool is lightweight kiddie pool that can accommodate smaller dogs and puppies. While this product is designed for small children, users say it’s the perfect wading pool for dogs, as well. This cute blue pool is shaped like an apple, and it’s 9.75” deep, 39.5” wide and 44.75” long. It can hold up to 22 gallons of water, making it the ideal cool down spot for smaller animals. Reviewers note that this pool is made from strong, durable hard plastic, so it can likely withstand your dog’s nails or a bit of chewing. The STARPLAY™ Large Apple Pool is also incredibly affordable, making it a great investment that will last for years to come. The downside of this hard plastic pool is that you’ll need ample space to store it in the winter since it doesn’t collapse at all.